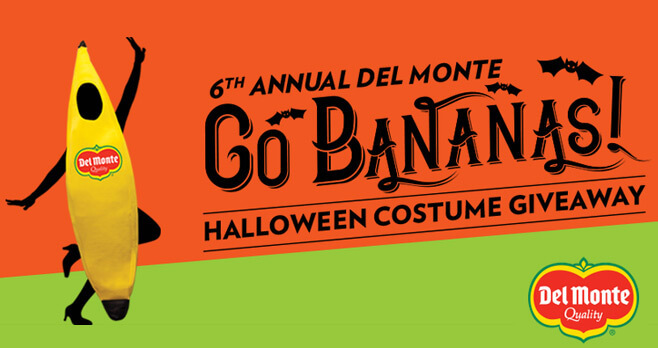 It’s time for the 6th annual Del Monte Go Bananas Halloween Costume Giveaway. This year again, Del Monte is giving away 1,125 banana costumes just in time for Halloween. Enter now and turn yourself into a Del Monte banana for more chances to win yours. Participation open only to legal residents of the 50 United States, the District of Columbia and Canada, who are at least 18 years old and the age of majority in their state, province or territory of residence as of date of entry. Void outside of the 50 United States, the District of Columbia, and Canada and where prohibited, taxed or restricted by law. Sweepstakes begins at 9:00:00 am EDT on September 1, 2017 and ends at 5:59:59 pm EDT on September 30, 2017. Option 1: Visit www.dm-gobananas.com and fully complete the entry form.Limit one (1) Option 1 submission per person/email address throughout the Sweepstakes Period. Option 2: Visit www.dm-gobananas.com and fully complete the entry form. Then, create a Face in the Hole entry by uploading a photo of yourself. Limit one (1) Option 1 submission and one (1) Option 2 submission per person/email address throughout the Sweepstakes Period for a total of six (6) total entries (one (1) Option 1 entry and five (5) Option 2 entries) throughout the Sweepstakes Period. Winners will be selected in a random drawing from all eligible entries received on October 9, 2017 at 1:00 p.m. (CT) in Chicago, IL. One thousand (1,125) prizes. Each winner will receive a Del Monte Banana Costume. Approximate retail value of each prize is USD $18.00 / CAD $23.00. Total ARV of all prizes combined is USD $20,250/ CAD $25,875. To obtain a list of winners, send a self-addressed, stamped envelope by October 30, 2017 to: Del Monte Fresh Halloween Winner’s List, Del Monte Fresh Produce N.A., Inc., 241 Sevilla Avenue, Coral Gables, Florida. Canadian residents may omit return postage.